Warrington Wolves have chosen to play Leeds Rhinos for a place in this year's Super League Grand Final. Wire had the right to select their clubcall opponents for the semi-finals after finishing top of the table and winning their opening play-off game. They will now host Leeds, who clinched their place in the last four by beating Huddersfield 34-28 on Friday. Defending champions Wigan, who saw off Catalan Dragons 44-0, face another derby at St Helens in the other semi. Next Saturday's clash at the Stobart Stadium (1 October, 1800 BST) will be the two old rivals' sixth derby meeting of the season - and their second in this year's play-offs. This season's first derby was the 16-16 draw at the Millennium Stadium in February when Wigan threw away a 16-0 lead with 20 minutes left on the opening weekend of the season. After enjoying a narrow 28-24 win at the DW Stadium on Good Friday, Wigan produced arguably their best performance of the season to win 32-10 at the Stobart Stadium in June before a narrow 18-12 Challenge Cup semi-final win at the Halliwell Jones in August. But Saints, beaten 22-10 by Wigan in the Grand Final at Old Trafford a year ago, emerged 26-18 winners when the sides met at the DW Stadium in the opening round of the play-offs last Sunday. 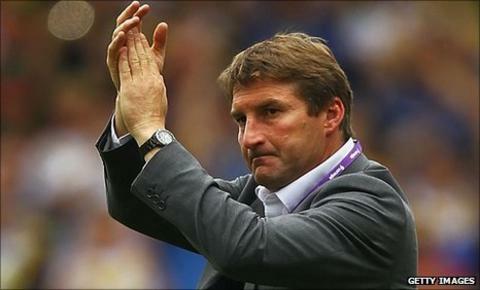 Warrington head coach Tony Smith refused publicly to have any part in clubcall, but it was no surprise that his club picked Leeds, who finished fifth, for Friday night's meeting at the Halliwell Jones (30 September, 2000 BST). "I know Tony Smith is not a fan," said Warrington captain Adrian Morley, who spent the first six years of his career at Leeds. "But I think it is an advantage for the team that finishes top to pick the side. "It's something that's got to be done, so we had to make the decision. It mainly came from Tony but the boys had a little bit of input into it. "A lot of consideration went into it and the fact that Leeds are the lowest-ranked side did probably sway it. "It was not an easy decision by any means. Leeds are a side with lots of threats everywhere. It's going to be tough." Leeds coach Brian McDermott admitted: "It was the most obvious choice. "I think there would have been a fair amount of consideration. I don't think it was a straightforward decision. We're looking forward to it. It will be a cracking game." Warrington ran out comfortable winners in both their meetings with Leeds during the regular season, both in the first half of the campaign, running up 40 points and scoring seven tries each time.